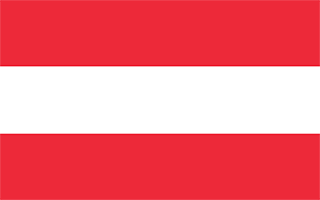 Austria with its capital Vienna is located in Europe (Central Europe, north of Italy and Slovenia). It covers some 83,872 square kilometers (about the size of South Carolina) with 8,754,410 citizens. German, Croatian, Hungarian and Slovenian are the common languages used in Austria (consider regional differences). Czechia, Germany, Hungary, Italy, Liechtenstein, Slovakia, Slovenia and Switzerland are bordering countries. Austria is a land-locked alpine country in Central Europe. Austria, along with neighboring Switzerland, is the winter sports capital of Europe. However, it is just as popular for summer tourists who visit its historic cities and villages and hike in the magnificent scenery of the alps. The diverse mix of landscapes is packed into a relatively small area of size. Glaciers, meadows, alpine valleys, wooded foothills, gently rolling farmland, vineyards, river gorges, plains and even semi-arid steppes can be found in Austria. Austria is a federation. Each of its nine federal states has a unique and distinct culture. Being at Europe's crossroads, their culture is influenced from many sides. The landscape is mostly mountains (Alps) in the west and south and mostly flat or gently sloping along the eastern and northern margins. The average density of population is about 104 per km². The climate in Austria can be described as temperatecontinental, cloudy, cold winters with frequent rain and some snow in lowlands and snow in mountains, moderate summers with occasional showers. Potential threats by nature are avalanches, earthquakes and landslides. To reach someone Austria dial +43 prior to a number. The local cellular networks are operated on 900 MHz, 1800 MHz, 3G, 4G. Websites typically end with the top level domain ".at". If you want to bring electric appliances (e.g. battery chaarger), keep in min the local 230 V - 50 Hz (plugs: C, F). The sign for the locally used currency Euro is EUR.